Today the game expands its horizons: Warhammer 40,000: Inquisitor - Martyr enters Steam Early Access. Suitably with this transition, there's a new update as well. Check out the full change log. Now, for those who are not familiar with the "Early Access" concept, it's basically a chance to get the game earlier to help in the development by providing feedback. Some features are still missing, although we have laid out our plans up until the full release of the game what new stuff to expect each month. That said, you're not really missing out if you decide to wait for the full release - you will not get an advantage with character progression, nor will you be able to play through the entire story campaign (although you will get a taste eventually). Early Access is for those who are willing to play a game in its less-than-complete form - any constructive or critical opinion is appreciated, especially during this phase. That said, you're welcome to ask anything and provide feedback so we can complete the game with as much polish as possible. This is the home of our Community, so feel free to explore and engage in conversations. Other than that, explore and enjoy what the game has to offer, and if there's anything you need, we'll be here to help! Devs, can you please create a separate sticky thread for the roadmap...it's way to hard to find here. Sure, no problem! 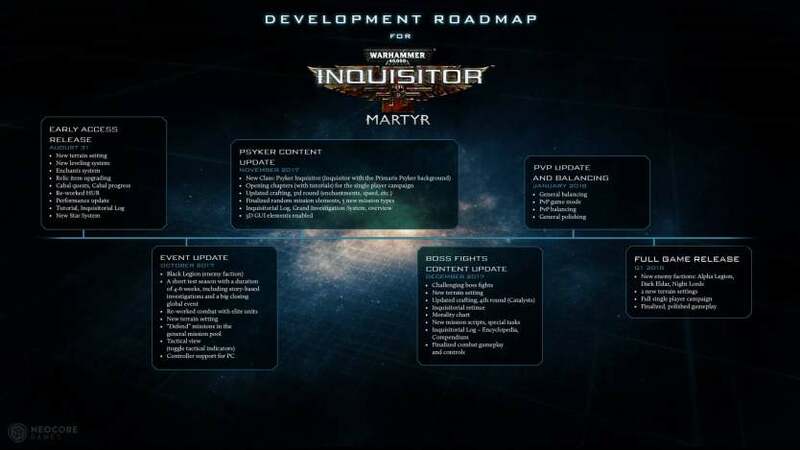 I will create a topic for the roadmap. About the Fortresses - We really want to add this feature into the game, but we don't know when this will happen. But as you can see, it will probably happen after release. It's a really big thing and need a lot of work. Unfortunately you can't upgrade right now, but later on this feature will be available. Is this a Hard Confirm that upgrading founding packs is 100% still on the cards then? P.S. How about executions? Are those in yet? This feature had to come with August patch? If I purchased this in Steam EA, can I give you guys another $30.00 and get the next package up? Have a similar question. I purchased on Steam and not from Neocoregames.com. I would like to upgrade to a higher tier of content and also how do I go about getting my name in the credits if I purchased from steam and not your store website? FEED ME!!!! I NEED AN UPDATE!!!! Dear Neocore, please give us some info. You have gone VERY quiet and it worry's early adopters and will seriously limit the amount of people who will buy into your game in early access. You SHOULD be giving WEEKLY updates via ALL channels. because of this, There are drawdowns. where is the Fortress feature? will i be able to upgrade my steam purchase to a more expensive ones like here on the webstore? "Megapull - 09/22/2017Just to be clear regarding the latest post - Our goal is NOT to turn the game into a grind fest. Leveling is slow at the moment because it is affected by a bug. We will fix it ASAP." Hi I am very new to the Inquisitor-Martyr. I see and know about the game via youtube not actually play. My thought, this game looks cool because I want to play this genre of game on Warhammer 40k setting. Yet, base on what I saw on youtube, I feel I don't like control of the game, which move and attack commanded by click. By this control players can do only move or attack at one time, not both. So I am writing this comment to ask if it possible for this game to have ASWD for moving and mouse click for attack with camera fixed on back of playing character. In my opinion, by this control player can move and dodge enemies while slashing or shooting making the game play more fast and flow. You can play the game with the WASD keys mate. I had the same problem when I first started and the realised that WASD works too. You may have to adjust the controls in settings I cant remember but it does support WASD for movement. Greetings brothers! Will the patch be out today???????? i just bought it on steam but how do i get the in game login to work? There is currently a problem with Win7 introduced in today's patch. It is to be addressed tomorrow. Well maybe they should introduce their face to my fist. Before tomorrow. The Win7 issue will be fixed today. Character movements and actions are very choppy when playing on my PC even on the lowest settings, and I own an asus republic of gamers laptop. There's also a bug where the foot steps sound effect would keep playing even when I'm not on a mission. So is this road map still relevant? do my Pledge (79.99$) include the early access? where can i get my key for the early access? Good day devs!!! Have such thoughts. Isn't Heavy Flamer MUST HAVE (HEAT) damage??? It's Flamer, why it haven't heat type of damage. When purging heretics they burning, (HEAT) i think must be. Good luck to you all!!! Don't see the Fortress mode on the Roadmap and the placeholder for it seems to be removed in the game. Have you scrapped it? Looking forward for the Controller Support! There seems to be no other performence update. Is this the final state of the game regarding performence? it doesn't work if that's what you mean?? No it's not. The game is still in alpha state. Optimization will come later. I'm sorry if I come of as a bit rude but what the hell is happening with the development of this game.Devs please you have been dead silent for the past 3 MONTHS.That's a long time and frankly it is extremely worrisome to see a behavior like this ,imho this doesn't bode well at all for the future of the game.I was very hyped when I first heard a union between my favorite game genre and my favorite sf setting is happening and I actually was pleased that you ,Neocore, were undertaking this task ( since I was a big fan of the first 2 Van Helsing games).Hoever since then my hype slowly changed to ...not even anger but dissapointment.No meaningul updates and no communication with the community whatsoever for a very long time.Please don't be that stereotypical example of a scumbag studio who makes a ton of promises but delivers on none and dumps it's project halfway trough early access.Don't let this game die before it's release,you have pure gold in your hands with the warhammer ip ,please dont squander this opportunity.If however this was just a quick cash grab, and let's be real here A LOT of people in the community are starting to think that even if they don't express it as bluntly as I do , man up and admit it ,give us some closure.Don't leave us hanging by a thread of false hope.I do hope that I'm very wrong about the latter part and development is well on it's way but judging by the missed goals ,so many missed goals, the outcome of this game is rather bleak in my eyes at least and that makes me very sad. Actually they haven't been silent at all. However, it is totally understandable that you think it to be the case. The Devs failed to make a formal annoucement regarding the delay of the Nov update, for reasons unknown. Instead they have been running around posting in the multiple threads that have popped up here & on the Steam forums. If you haven't taken the time to look into all these various threads to track down info, then you might very well think that the Devs have gone AWOL. Currently, this is the situation. The Nov & Dec updates are being combined into one large patch that is planned to drop this week. You are welcome. Hopefully the Devs will learn from this mistake and not repeat it if there is a next time.